What a week that went past! 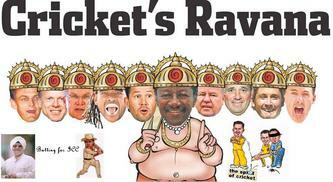 The cricketing world was divided vertically on the rights and wrongs of anything related to cricket. Records books were scoured to score points off the field. Without sounding jingoist (which I am anyway) I knew the Aussies had it coming! What surprised me was that it came from Indians (despite the Sanjay Manjrekars or Bishen Singh Bedi) – with anyone having a say in this country in matters concerning cricket – ICC’s protestations notwithstanding Indians wins this round hands down! It is no ones claim that Aussies are not the best side and who deserve to win every match the play, it is their attitude of playing the game outside the realm of sportsmanship that is at the core of the issue. And some media channels NDTV in particular with some worthies that have been named above chose to dig a lonely path just for the sake of appearing different. Their comments reeked of this attempt to create a USP for themselves. And pray! Sanjay was asking Indians to play on the field and win the match to silence the Aussies – if wishes were horses… And while he was making this statement on NDTV, ICC was bent on ensuring Steve Bucknor stand in that test too. Was there a remote possibility of winning on the cricketing field, Sanjay? On hindsight, it appeared that it was another voice along with the Aussies against the words of Tendulkar (yeah yeah! plain jealousy – refer to a few articles this worthy has written about Tendulkar). Bishen Singh Bedi – lesser said the better. The person who given a chance would have turned out to be “good drowner of non performers” trying to talk sport (he conveniently forgot the past – selective amnesia this). NDTV botched up in its attempt to be a channel with a difference (and incidentally this blog refuses to appear on its website – maybe they get the certificate from the Aussies – but then who in the world would consider anything from Aussie a compliment? Steve Bucknor should stay, Indians should stay, Harbhajan maybe said it, Due process of law – my foot! An Australian player can accuse an Indian player of making a racist comments with absolutely no evidence and still be banished from the game and here we have the intellectuals advising to take it lying down. SM and BSB, what India did was not just for Indians (though I dont see any iota of pride of belonging in your guys) – it is for the sake of the sport and more specifically for the Asian teams who more often than not are the victims of this white hegemony. And yes! ICC were on the lookout for some ambassadors and they wanted someone just like you – all the very best (the application has been made in the form of the Television interview) and I hope you would land some job there. And thanks we know what is national pride, it is not something that can be mortgaged on the some stupid penal financial ramifications or pseudo-sportsmanship. And it was no grace at all on the TV show when you state Sherry had the expereince of walking out – and tell me, what did you do staying back out there? Lost more and sold the country’s pride for peanuts (oops!!! Sorry Symonds Pun Intended ). So stop the nonsense! Dear Sanjay! You can never reach the heights Tendulkar reached just due to these reasons.